One of the most distinctive and elegant buildings on the avenue, this very attractive apartment building was erected in 1929 as a cooperative. The 14-story building has only 27 apartments and was designed by Rosario Candela and Kenneth M. Murchison and erected by John and Joseph Campagna, the son of Anthony Campagna, one of the citys most important developers of luxury residential buildings. Candela was the leading architect of luxury apartment buildings of his era. It is just to the south of the charming former town house at 1025 Park Avenue of Reginald deKoven, a composer, designed in 1912 by John Russell Pope in Jacobean style (see The City Review article). DeKoven on his wife composed "Robin Hood," a light opera in 1890 that featured a song, "O Promise Me," and he also help built the Lyric Theater on West 42nd Street. That small building is a designated city landmark and has been subdivided into cooperative apartments. This red-brick building with a three-story limestone base, gargoyles and a handsome enclosed rooftop watertank enclosure. It is notable because its asymmetrical design makes it appear to be more than one building and because it is also very compatible with the very handsome former townhouse of Reginald de Koven, and it is also directly across the sidestreet from another very interesting mansion, the former New World Foundation building at 100 East 85th Street (see The City Review article) that was originally the Lewis Gouverneur Morris house designed by Ernest Flagg in 1914. 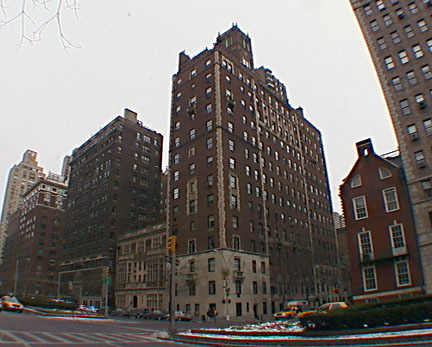 This apartment building has considerable "light-and-air" because of both the mansions and the Park Avenue Christian Church, designed by Cram, Goodhue & Ferguson in 1911, diagonally across the avenue. This building, which has a doorman, but no garage, adjoined the garden of Mrs. Reginald de Koven, widow of the composer, and also backed up on the garden of the Park Avenue Methodist Church on 86th Street. The building is not far from to the Metropolitan Museum of Art on Fifth Avenue and there are numerous schools and religious institutions nearby. Cross-town buses run on 86th Street and an express subway station is at Lexington Avenue and 86th Street as well as major stores such as Barnes & Noble. The area also has several movie theaters.